Be a Master of Ceremonies. members are encouraged to become an MC for a night or half night. This page aims to provide the vital backup support. The information is also in the folder ‘MC’ available at an evening. Please tell us of anything you'd like or might help others to prepare. JVC Portogram - Details on playing CDs using the remote controller. The following files list the dance music available from the club. If you are choosing music for a dance where we don't have something specific, or you don't like our music for it, then music for a not too popular dance with broadly similar movements on the same bars is a good choice. The music can suggest setting in place or the hop when starting to travel or the movement in a circle for instance. Or just try out a couple of tracks from the 'Music by type' list. Except for the most popular ones, the link between the dances and their music is nowhere near as fixed as the lists here suggest and many people would be hard pressed to tell the difference between a reel and a jig. Dances with music (260 Kbyte) in alphabetic order, with suggestions where we don't have music. Includes local popularity ratings. The 'Hard' field attempts to rate the difficulty of the dances. Music by type, bars and times through(268 Kbyte) They are arranged by type of dance, then number of times through and bars. See Dance Popularity Counts below for a sortable list giving frequency in the South-East region. Grand Chain: Hints and Tips. Info on running an evening. 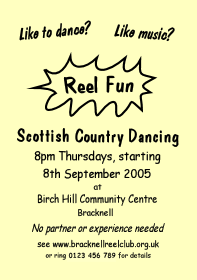 Useful documents about Scottish country dancing, including notes on planning a dance program and a guide to briefings. Over 5000 at the last count. The download contains a Word document - you can get a version with all the cribs in plain or else the later version that uses macros to generate a dance programme. 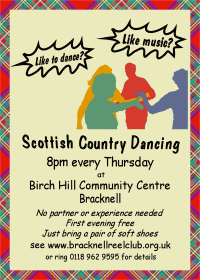 This is a comprehensive database of Scottish Country dances. It has cribs of many of the dances and short snippets of the tunes. Local Groups should use the BHS planner to avoid conflicts. Our recruitment adverts over the year. The telephone number has been obscured in any demonstration advertising material. The Club logo: 1160x1160 as a PNG file (32 Kbyte). 2006 flyer: Left Hands Across. 2010 brochure (pdf): folded A4 brochure (415 Kbyte). 2012 flyer (pdf): Amazingly a folk dance group in America came up with the same tag line so I copied. their format (155 Kbyte). 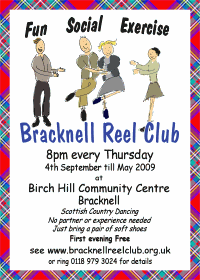 This list gives an estimate of the popularity of dances both locally and in the South-East of England region. Take the hard value with a big pinch of salt especially for the low popularity dances! Most of this is automatically generated from the emails of the SCD dance list from Summer Tuesdays and email-a-programme. The popularity is under Local and Global and sorted in descending order for global. Local means BHS with a portion from the global list. Global means local dances plus programmes from the dance list. The popularity is out of 2000. Strange figure but it means basically the figures are how often as a percentage you would expect the dance in a 20 dance programme. The red and green colours are an estimate of whether the dance is getting more popular or less. Click on the column head to sort the list differently. 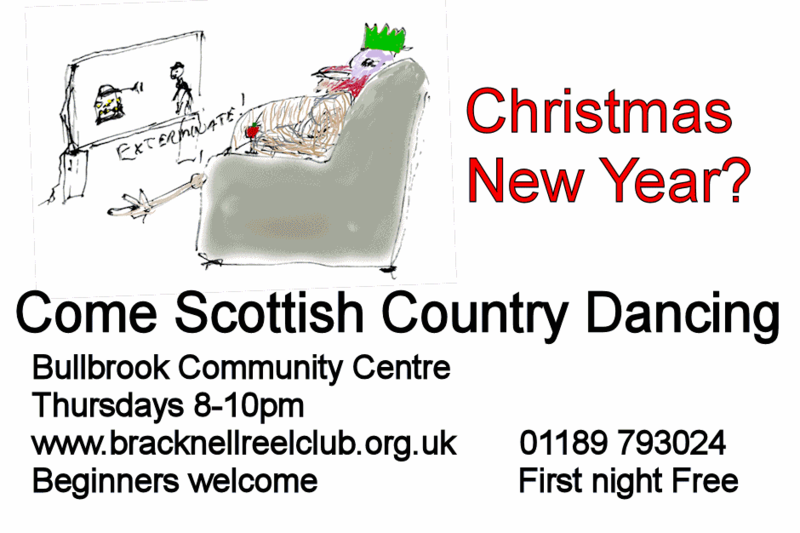 The lists below gives how many times each dance was in a ball or ceilidh programme in the local area (approx 20 miles from Bracknell) in the season indicated. Our dance popularity table for M/Cs uses this to bias the ‘global’ data above. Previous years: 2016-2017, 2015-2016, 2014-2015, 2013-2014, 2012-2013, 2011-2012, 2010-2011, 2009-2010, 2008-2009, 2007-2008, 2006-2007, 2005-2006.